MistyMcIntyre.com » Blog Archive » Back to the Future? Ok, so VaRonica and I went out to lunch and as we leave the restaraunt I spy this totally random guy. 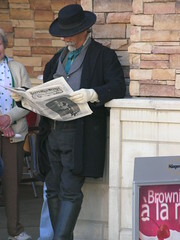 Check him out: he is dressed as an old western cowboy. His paper, if you check close, is not designed to look like a modern rag. He was just hanging out…looking cool. So, VaRonica says she will “pretend” she is posing for a picture and I totally snapped one of this guy. He reminds me of Sam Shepherd, which gets my heart racing….just a little bit.